In addition to the basic principle stated in §4.3.4.1, SBLHS capitalizes the term Gospel when it is a substitute for a title of a work that is capitalized. So, for example, because “Gospel of Mark” is capitalized, the title substitute “Mark’s Gospel” is likewise capitalized. Further, SBLHS capitalizes the word Gospels in two instances: in the title “Synoptic Gospels” (here we diverge from CMS §8.105); and when it refers to the “division of the canon” (this is revised below at §3.4). The word gospels is lowercased, however, when it is a generic reference that includes noncanonical gospels (e.g., infancy gospels). 2.1. In keeping with standard English-language practices, we capitalize proper nouns (e.g., Synoptic Gospels). The following examples, which include stock phrases and selections from manuscripts, attempt to illustrate how these principles can be applied individually and in tandem. 3.1. 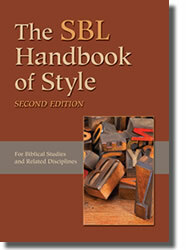 SBL Press regards certain terms as proper nouns or titles in all instances. The Fourth Gospel has enjoyed a special place in the discussion of the gospels because it is significantly different from the Synoptics. The recording and the opening of books is not mentioned in Matthew’s Gospel. One sees, however, the motif of accountability in the gospel [see 3.2 below]. 3.2. Certain stock or common phrases are generally lowercased. The scene of the temptation in both gospels serves as a test case of Jesus. These traditions are sufficiently different and highlight aspects of the gospels’ theologies that help account for the variances. 3.3. The phrase “the gospel” (and parallel phrases) usually is not a substitute for the full title of the work but rather a generic reference to it; as such, it is lowercased. The Adamic tradition of veneration of humanity might also be perceived in other parts of Matthew, including the magi story narrated earlier in the gospel. 3.4. In our view, references to the four New Testament gospels do not bear any canonical import (the classifications or groupings of New Testament books are significantly different from the canonical divisions of the Hebrew Bible), so gospels in this context should be lowercased. If there is any danger of misunderstanding, clarify the term with an appropriate adjective (e.g., New Testament, canonical). The canonical gospels present a plethora of demonic activity that is highlighted in numerous pericopes about the ministry of Jesus and his disciples. The expression “son of man” is used in the gospels and Acts as a title, with the implication that it refers to the messianic figure of Jesus. Paul’s letters and the gospels differ not only in terms of basic genre but also with respect to the Christology that they espouse. From this perspective, the Pauline letters correspond to the charismatic stage of authority, whereas the gospels reflect a traditional type of authority. 3.5. If seeing gospel lowercased feels somehow wrong, one can always revise the bothersome sentence. The same sorts of questions and considerations arise with the formatting of Law/law, Epistle(s)/epistle(s), and Torah/torah, all of which will be discussed in future posts. For now, feel free to use the comments to ask how we would treat other specific examples.